Automotive Laser headlights are laser-assisted headlights which primarily comprise of laser diodes and a phosphorous lens. These laser lights offer almost four times the brightness of an LED-powered light. Manufacturer in the market are expected to focus on the miniaturization of the headlight systems without compromising on the intensity of light. The primary benefit of laser-assisted headlights for drivers is that these headlights have the longest illumination range compared to any current headlight technology. This provides the twin advantages of improving visibility for the driver and subsequently better road safety. According to the research report, the global automotive laser headlight market is expected to be worth US$359.29 bn by the end of 2025 from US$1.09 bn in 2016. During the forecast period of 2017 and 2025, the global market for automotive laser headlights is expected to rise at a whopping CAGR of 69.77%. The automotive laser headlight market has been segmented into three categories: by vehicle type, by sales channel, and by region. In terms of vehicle, the automotive laser headlight market has been classified into passenger vehicle and commercial vehicle. In terms of revenue, passenger vehicle segment held the largest market share in 2016, owing to the increased in demand for passenger vehicle embedded with hi-tech features on account of increased disposable income over the couple of years growing in the emerging nations. The increasing disposable incomes, especially in the developing economies of the world is expected to play an integral role in the adoption of automotive laser headlights in passenger cars. Commercial vehicles are likely to be slow adopters of automotive laser headlights due to their high cost. By sales channel, the automotive laser headlight market has been segregated into OEM and aftermarket. In terms of revenue, the OEM market segment of the automotive laser headlight market constituted more than 90% market share in 2016. OEMs will be the first ones to integrate this innovative technology. Meanwhile, as the demand for automotive laser headlights picks up pace its demand in the aftermarket is also expected to shoot up. However, until 2025, the OEM segment is projected to lead the global market. In 2016, Europe dominated the automotive laser headlight market with more than 40% share and is expected to follow the same trend during the forecast period. Germany is at the forefront with significant adoption of this innovative technology. The well-established automobile manufacturers in the developed parts of Europe are expected to keep this regional market ahead of others. Europe and North America are well known for being the pioneers of automotive technologies. Hence, it is highly probable that growing technological advancements will be deployed in these region in significant numbers, considering the acceptance from end customers. Asia Pacific too is expected to show tremendous progress as the emerging economies offer lucrative opportunities to the automotive sector. 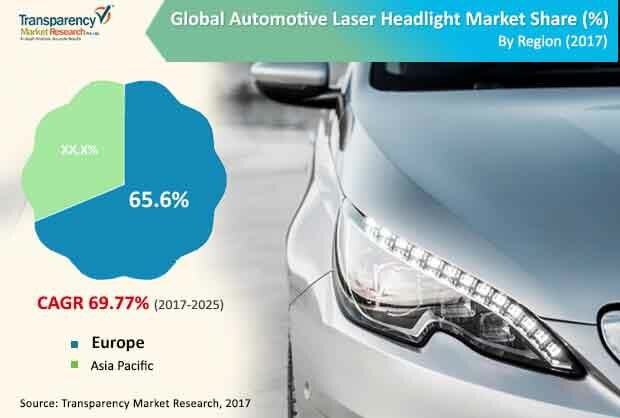 A wide base of younger population with a higher purchasing power in countries such as Japan, India, and China are expected to propel the automotive laser headlight market of Asia Pacific. Key players in the automotive laser headlight market are expected to benefit from the formation of strategic alliances with global players in the automotive laser headlight detection market. Prominent players in the automotive laser headlight market are OSRAM, Robert Bosch, Valeo, SORAALASER, ZKW Group and others. This report analyzes and forecasts the market for automotive laser headlight at the global and regional level. The market has been forecast based on revenue (US$ Mn) and volume (Million Units) from 2017 to 2025. The study includes drivers and restraints of the global automotive laser headlight market. It also covers the impact of these drivers and restraints on demand for automotive laser headlight during the forecast period. The report also highlights opportunities in the automotive laser headlight market at the global and regional level. The report comprises a detailed value chain analysis, which provides a comprehensive view of the global automotive laser headlight market. Porter’s Five Forces model for the automotive laser headlight market has also been included to help understand the competitive landscape in the market. The study encompasses market attractiveness analysis, wherein end-users are benchmarked based on their market size, growth rate, and general attractiveness. The report provides estimated market size of automotive laser headlight for 2016 and forecast for the next nine years. The global market size of automotive laser headlight has been provided in terms of revenue and volume. Market numbers have been estimated based on key sales channel, and regional segments of automotive laser headlight market. Market size and forecast for each major Sale Channel and Sales Channel have been provided in terms of global and regional/country markets. The study provides a decisive view of the global automotive laser headlight market by segmenting it in terms of sales channel, and region. These segments have been analyzed based on present and future trends. Regional segmentation includes the current and forecast demand for automotive laser headlight in North America, Europe, Asia Pacific, Latin America, and Middle East & Africa. The report also covers demand for individual application segments in all the regions. The study includes profiles of major companies operating in the global automotive laser headlight market. Key players in the automotive laser headlight market include OSRAM GmbH, Robert Bosch GmbH, Valeo S.A., SORAALASER, ZKW Group among others. Market players have been profiled in terms of attributes such as company overview, financial overview, business strategies, recent developments, and SWOT analysis. The market for automotive laser headlight is primarily driven by rising demand for eco-friendly agro products. Industrialization has led to urbanization, which has resulted in migration to cities.